As an avid Harry Potter reader (Yes, I was one of those weirdos who would line up outside a bookstore to get a copy of Harry’s newest adventure… no, I did not dress up) I was excited for the last movie, Harry Potter and the Deathly Hallows: Part 2. In my humble opinion, the seventh book was a literary version of the Sistine Chapel. It was the perfect ending to the series that was over a decade in the making. Every twist and turn kept you engrossed and yet all the questions I had formulated over the years were answered. Everything made sense. With that being said, this latest movie was better than okay, but not great. I loved everything about it – from the costumes and magic to the dialogue quoted directly from the book – until the last half hour. In short, the filmmakers completely screwed up the final fight. The ultimate climax of an epic eight movie series (that’s 4,176 pages!) was magical and enchanting but only subpar to those of us who have read and reread the books. Even my 17-year-old brother turned to me at the end and said, “That’s it? That’s how he dies?” There was no grand finale to the fight, it just sort of subtly ends, like a train slowly rolling to a stop, which is completely opposite of the book. Some of the book’s best scene – whether funny, tearful, or gut-wrenching – were either hinted at, glanced over, or complete rewritten in the film. Visually, it’s a beautiful film. Action-packed from the beginning as Harry, Ron and Hermione race to find and destroy the Horcruxes. What seemed to be an impossible task in Part 1 becomes a domino effect, with one Horcrux leading to the next, inevitably leading to the final battle between He Who Shall Not Be Named and Harry at Hogswarts. Every action scene is enthralling, with camera angles and visual effects that make Harry’s magical world come to life. The few moments without wands casting curses are used to answer lingering questions, though not to the extent of the book, which may leave those who haven’t read the books a little confused. The best part about this film was how director David Yates and his team were able to capture the emotional feelings the book gave you. The one-liners and funny moments are timed perfectly. The use of music, and even the conscious decision to have silence, helped you feel Harry’s loneliness as he bears the weight of the world on his shoulders, or his excitement as he triumphs and is one step closer to his goal. Even the few scenes that aren’t in the book, my favorite being where Neville and Seamus are given permission to blow up part of Hogwarts to help defend it, provide humor and depth. 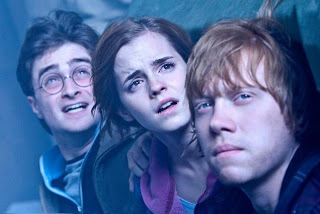 While Part 1 focused solely on Harry, Ron and Hermione, Part 2 engages all the Harry Potter characters and their essential roles in the fight against Lord Voldemort. It captures how Harry relies on so many people to help him and yet is ultimately left alone to face Voldemort and decide the fate of the world. Nice review. Oddly enough, I thought the fight at the end of the book was anticlimactic, and that the movie upped the ante. I seem to remember Harry more or less casting one spell against Voldemort in the book and that was it. It's been a while though.